We have been really lucky this year and the children have been to see lots of shows at the theatre. Some I would recommend, others not, so here is a little summary incase you are thinking of getting tickets as a Christmas gift. Standing head and shoulders above the rest was Up and Down by Gaga theatre company. We hadn't read the book, but had read lost and found. It was proper theatre with no huge costumed characters. The boys loved it as it was engaging and they participated with the audience. The only down side was that as it was aimed at pre schoolers it was in school hours and big man couldn't join us. You can read my full review here. I know that Justin Fletcher is a bit like marmite, but after seeing him in Panto for a couple of years I loved him. Yes loved not love. This performance has totally changed my opinion on the performer. It was the laziest show I have ever watched. Dancers were used as time fillers. There was very little humour. If you were sat in the stalls you may have enjoyed it more but in the circle you felt left out. All of the boys were bored as were all the children sitting near by. In my opinion a total waste of money. This was another good show. The puppets are amazing. There were a lot of small children here, which was a bit of a shame as it's filled with so many facts I think it better suited ages 5-9 than preschoolers. The best place to sit for this show is on cushions at the front as if you are sitting here you are more likely to be invited up on stage. The downside to the show is other parents not looking after their children. The presenter makes a joke of how rogue children will be eaten by dinosaurs. Unfortunately this didn't stop the same little girl walking up on stage twice and being called a rogue child. Don't worry if your child hasn't got to participate in the actual show though as afterwards there is a meet and greet with the puppets. It was a lively performance for any child with an interest in dinosaurs. I have one massive Octonauts fan and 2 that used to be and still enjoy it. I was unsure what they would make of the show as at the time that the tickets went on sale there was no details about what the show was like. The show was good and consisted of costumes characters and puppets in parts. Personally I preferred the puppets but the whole show was well done and little man was particularly keen. 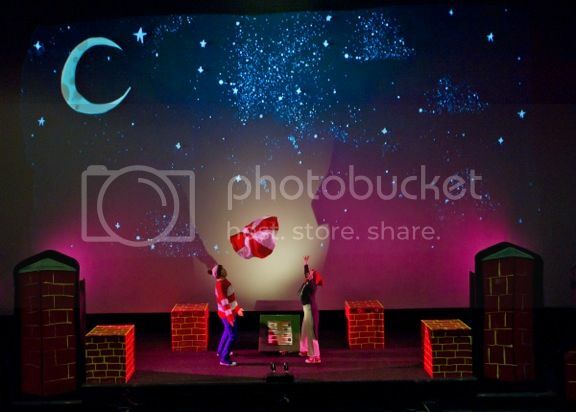 Have you seen any children's theatre this year? What would you recommend and what would you avoid?